If you have relapsed after a long period of sobriety, you may feel despondent and incredibly guilty about all that has been lost. The worst thing you could do now is allow the negative feelings to keep you trapped in addiction. Not all the experience you gained during your time sober has been lost, so this does not have to mean going back to square one. If you can learn from where you went wrong last time, it can mean that you can enjoy a much better sobriety this time round. Here are 10 tactics to help you start again after a relapse. If you have only just started drinking again, there is no reason for you to continue any further with this behaviour. Do not be fooled into thinking that you would have to hit some new rock bottom for you to be able to quit again. All you will get by continued drinking is pain and suffering, but it will be possible for you to avoid all this. You just have to decide that you are not going to allow things to slide any further and that you are going to do whatever it takes to get back on track. The chances are that one of the main reasons you relapsed is that there was a part of you that still wondered if you would be able to drink or use drugs safely again. As long as you entertain this type of ambivalence towards recovery, your sobriety will always be weak. What you need to do now is fully accept the idea that you can never engage in this behaviour. This means you can now fully commit to sobriety, and you will be rewarded for this with increased commitment with better results in your life. 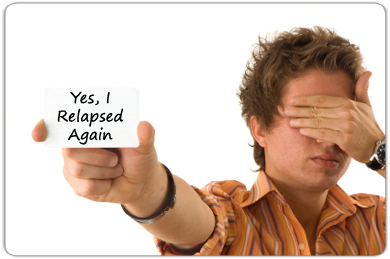 It has often been claimed in recovery circles that those who remain grateful for their sobriety will relapse. The problems start when you begin to take things for granted. The majority of alcoholics never manage to recover from this condition, so being sober is a big deal. If you start to treat it more like a precious gift, this will give you the motivation to really fight for your sobriety. It would also increase your general level of happiness because inner well-being is not about getting new things but about appreciating what you already have. It may be helpful to write down the details of your relapse. It is likely that the seeds of this event can be traced back weeks or possibly months before you actually took a drink or drug. Reflection on what happened is vital because, if you are not clear about why you relapsed, the chances are that you will do it again. It is also important to look at your previous approach to recovery as a whole because it is very likely you were doing something wrong. Try to be as objective and honest as possible when writing this report about your relapse. If you are still not sure of the real cause for your return to substance abuse, it may be best to speak to an addiction therapist or someone who has been sober for a long time and is likely to understand what you are going through. If you have not been to rehab, this could mean that you do not have the right tools and support for living free of addiction. Maybe now is the time to try this option. An inpatient treatment programme would allow you to spend time with therapists, and these professionals are going to help you understand what went wrong last time. If you have been to rehab already then it can be a good idea to go back again as this will help you deal with any unresolved issue that have been preventing you from building a strong sobriety. There are many different types of inpatient programme available, so you are sure to find something suitable to your needs. The benefit of keeping a daily recovery journal is that it allows you to document your progress, making it easier to assess your sobriety. This means you can evaluate any changes you make to your recovery to see the effect this has over time. If you do not document things like this then it is easy to miss what is happening; this is because humans have a habit of adapting quickly and taking changes for granted after a short period. It could be that some of the strategies you have been using to stay sober are not really helping you, so journaling could allow you to see this. If you want, you can do your journaling in the form of an online blog, which will allow you to share your journey with others. No one approach to recovery works for everyone, so it may be that until now you have been using an approach not appropriate for your needs. Maybe it is time to try something different. If you have never tried a 12-step group, you might want to try this fellowship. If you haven’t found much success with groups like AA, you could try an alternative such as SMART Recovery. You will find plenty of information on this website about different alternatives; just keep experimenting until you find what works best for you. Getting more involved in the recovery community can be an excellent option as it means you will be surrounded with plenty of support. You will also be able to benefit from those who have more experience than you do in sobriety. Getting sober will usually mean you will have a lot of free time on your hands, but you can avoid boredom by getting obsessed about recovery. As well as spending time with sober people, you can also read recovery books, watch videos on YouTube, or visit recovery blogs. Some great online recovery communities are also worth checking out. If you returned to substance abuse due to an episode of anger (this is common), you will definitely need to develop new strategies for dealing with this dangerous emotion. The problem with anger and resentment is that it prevents you from thinking rationally. There are many tools for dealing with this emotion, so attending an anger-management class may help. If you treat your recovery like a small business, you will understand the need to be constantly taking steps to maintain it. This should be your number one priority in life because, if you lose it, you are likely to end up losing everything else anyway. Treating your sobriety like a business allows you to be more objective about what needs to be done, preventing you from becoming complacent. Just as a proper business, you can do inventories, set yourself targets, and even develop your own personal business plan.